Last year during ALA Annual 2014, Kendra (from the blog Read Sing Play) and I presented an Ignite session all about playing with babies at the library. It remains to this day one of my favorite presentations. After talking about it for months, we decided to start blogging about all of our crazy ideas for babies! 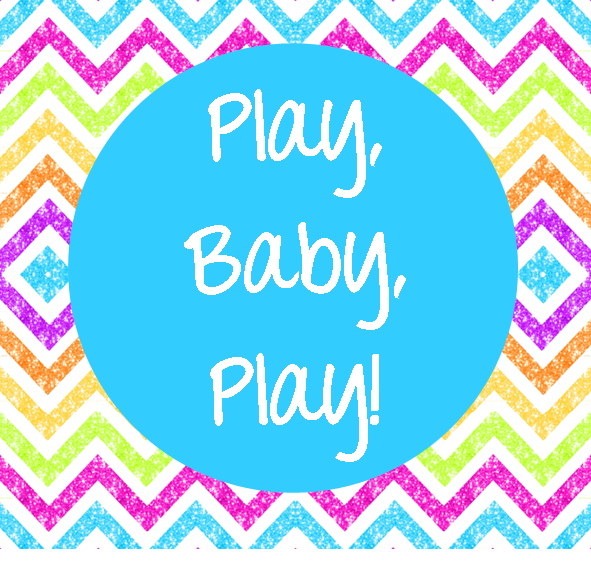 We're calling this new series, "Play, Baby, Play!" 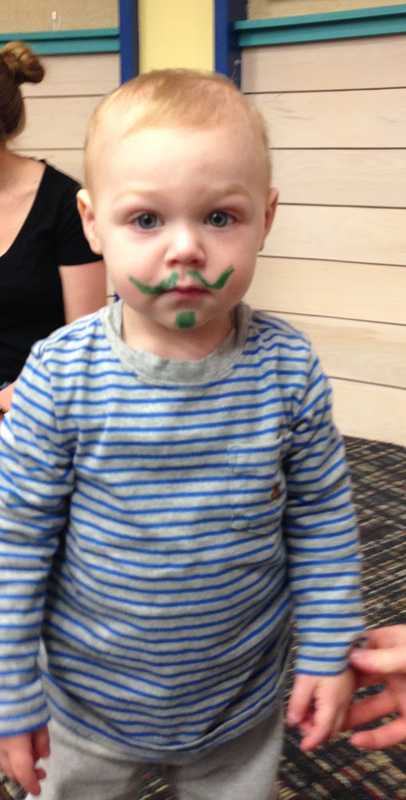 This week, I'm copying directly from Kendra's great post about drawing on baby's faces. I always try to do something special for our last storytime of each session, and I knew my group would love this activity. I encouraged the parents that I have tried this on myself and multiple babies and I promise it'll wipe off. There are always looks of disbelief that this will actually work. Simply pull out washable markers and baby wipes. It really does work, I swear. Usually once one parent is brave enough to try others join in. We got some really funny faces this time. 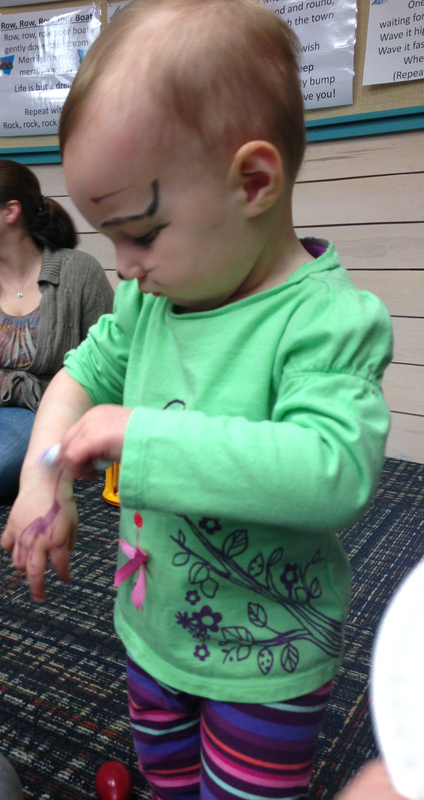 We also got some brave parents who let their children draw on them! We had one artist who was so into it that she took over the drawing all herself. 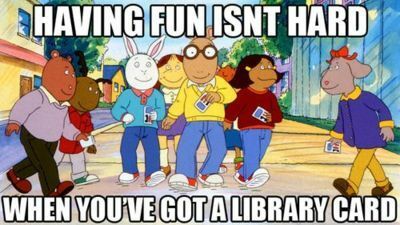 So, why do we do this in storytime? It's a great activity to use with the "talking" skill. I always encourage parents to describe to their child what they're drawing and use descriptive words like bumpy and smooth. It's also a fun way to play! Plus, by the end of storytime parents and babies alike were all giggling over how silly everyone looked. Also, I always keep a stash of paper plates for kids to scribble on in case the parents or kids are not feeling the face drawing, or for little ones with skin allergies. So, how do you play with babies at your library? Tell me about it! Today is all about my favorite early literacy websites! These are sites I check on a regular basis to make sure I'm staying up to date on early literacy and child development. These are also the sites that I refer caregivers to when they are looking for more information. This is a site that is great for basic information about literacy, as well as research based results. Some of their link compilations haven't been updated in a few years, but they are still full of great information. I'd check this site out when you are looking for a more in-depth research about early literacy. This is a great site for all kinds of literacy information. The "Worth a Read" section is usually where I start on this site. It's a news feed for all the latest literacy information. This is our state's early literacy initiative that is near and dear to my heart. It is all about getting information into the hand of people who need it the most. They have a great blog to follow, as well as a great section for librarians. This website has everything you could ever need. There is information about early literacy, but there's also a ton of information about literacy for all ages. They have book lists, information about struggling readers, great videos showing literacy in action, and so much more!